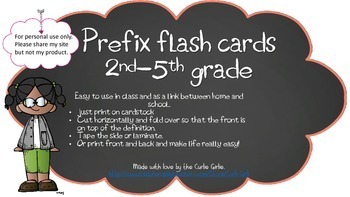 Build school and home connections with my prefix flashcards. They range from 2nd to 5th grade and can be utilized in the classroom during guided reading, on your anchor charts, RTI's and mini-lessons. 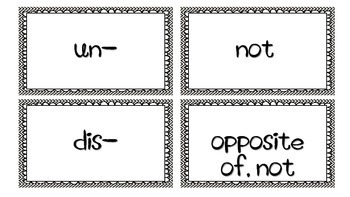 Print them out and place them in a center in your classroom. Give them to parents in zip-loc bags for parent nights! 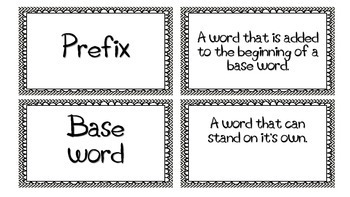 Prefix drills for the parents that you are able to give a mini lesson on equals a great take away. 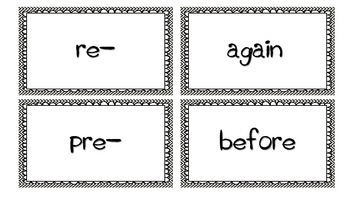 Help students build their vocabulary by strengthening their prefix exposure. Covers Common Core and TEKS ELA 2.5B. ELA 3.5B ELA 4.5B and 5.5B. Assist students in preparing for STAAR without test prep.